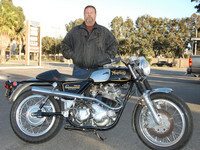 Congratulations to Bill Kerylow of Buena Park for winning Bike of the Month with his 1970 Norton Commando 750ss. This Commando started out as 13 boxes of parts that Bill bought in 1999. It took him about two years to put them all together into a running bike, and he has done many mods since then. The bike has a 1970 frame, 1971 engine, and a 1973 front end. One of the biggest modifications was changing the primary drive chain to a dry belt system. This dropped twenty pounds from the weight of the bike. Bill says it shifts much smoother with a dry clutch. Bill told me the mods were too many to mention, but here are a few of them. The front brakes are Lockheed calipers on a 13" rotor set up for racing. The wheels are 18" alloy rims to allow for modern tire sizes. The exhust system is SS headers with Conti replica mufflers. The entire engine is covered with finned accessories. This bike was a crowd favorite. Check out all the pictures in the November Gallery. Thank you Bill for bringing out. Sadly, Bill Kerylow passed away on May 14, 2011. Brian Wilcher wrote a nice memorial page for him Bill Kerylow Memorial.